:"Faith is taking the first step, even when you don't see the whole staircase." Dr. Martin Luther King, Jr. The Faith It Til You Make It, Vol. 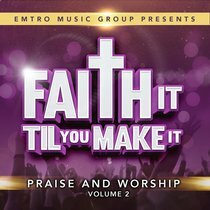 2 album is a collection of praise and worship hits and a continuation of the highly beloved compilation series. The next edition serves up a buffet of Billboard Radio hits and fan favourites designed to enhance the listener's total praise and worship experience! Faith It Til You Make It, Vol. 2 features memorable hits such as "I Lift My Hands" by Arkansas Gospel Mass Choir, the Youth For Christ classic "Love Comes in All Colours" featuring gospel great Kim Burrell, "Dwell Together" by Bruce Parham and the Joe Level & St. Steven Temple Choir fan favourite "Hide Me" featuring the signature vocal talents of the late great Lecresia Campbell to name a few. In addition, the album debuts new music by The Craytons, recently signed by the label, Metro Gospel This collection will resonate very well with all faith based music fans. About "Faith It Til You Make It Volume 2"